Our simple email reminder add-in works in the following way - it sends you an email reminder to your email (which can be checked on your smart phone) reminding you of your appointment. Our simple email reminder add-in works in the following way - it sends you an email reminder to your email (which can be checked on your smart phone) reminding you of your appointment. 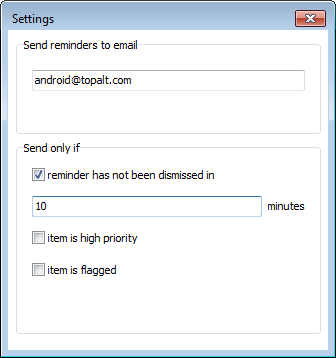 This can be customized to send emails if your pop up reminder was not dismissed within ten minutes, or has been flagged as high priority. Simple equipment/items tracking system for small renting facility (track not-serialized items that are circulated in large quantities).